My Flight Blog: No more Flying Miss Daisy! No more Flying Miss Daisy! 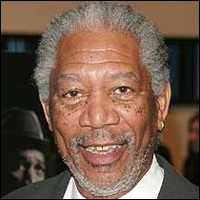 Morgan Freeman will need to return to driving Miss Daisy as his newly acquired pilot's license has been revoked by the FAA. The Oscar-nominated star who has spent the past few years chasing Ashley Judd in frighteningly similar films failed to observe landing regulations at Teterboro Airport in New Jersey. During approach, pilots need to wait for approvals from air traffic controllers before descending. Freeman reportedly descended 2,000 feet without previous approvals and therefore violated FAA regulations. An FAA official stated "Each airport has specific approach procedures that are published for that airport, and pilots are given directions by controllers as to what altitude to maintain." Freeman made the following comments, "I'm being censored by the FAA, and they're going to ground me. The hardest thing about flying is holding altitude." Many pilots on StudentPilot.com have blasted Freeman for not being able to maintain altitude. When I first learned to fly, managing altitude was tasking but over time became very manageable to the point where maintaining feet to an degree of accuracy of +/- 100 feet is not difficult. Though in Freeman's case the arrival procedures to a busy airport can be tricky for a new pilot.